Imp Stool is an alchemy reagent harvested from the small golden-brown mushroom of the same name. 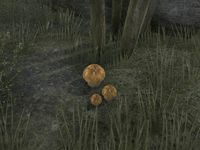 The fungus can be found growing in all zones and can occasionally found by killing Shroom Beetles, if you have the Morrowind Chapter of the game. Like other mushrooms, it tends to grow in shade and not in open spaces. This chart lists only combinations in which two or more of Imp Stool's effects are present. This page was last modified on 25 June 2018, at 18:11.